Multiple threads, some intertwining, combine to form a tapestry exploring the War on Drugs. Shown are all aspects including users, distribution, enforcement, and policy. 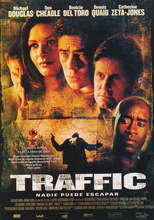 Based on a British miniseries by Simon Moore, Traffik (1989). Won Oscars for Best Director, Best Supporting Actor, Best Adaptation and Best Editing; received a nomination for Best Picture.